Bright, open and boundless, this Hawaiian chateau shines from the inside out, displaying for you the surrounding beauty of tropical Kauai. 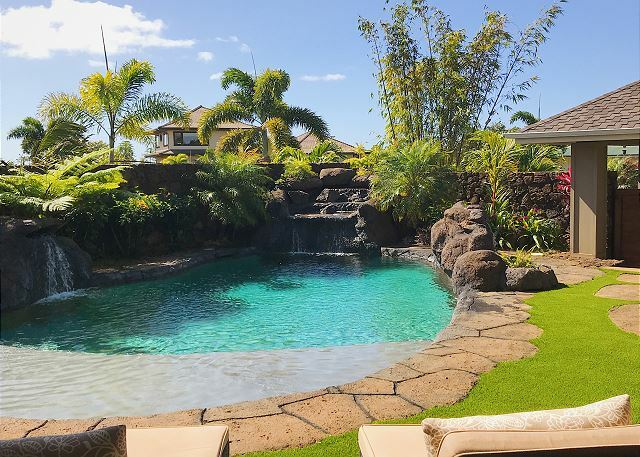 Featuring a private pool, luxurious jacuzzi, spacious lanais, expansive views and a large yard, this brand new estate home is paradise in and of itself. With 2,700 square feet of intentionally-designed space, this regal estate is equipped with state-of-the-art appliances, furniture and amenities. Four bedrooms and 5 bathrooms easily accommodate 10 people. 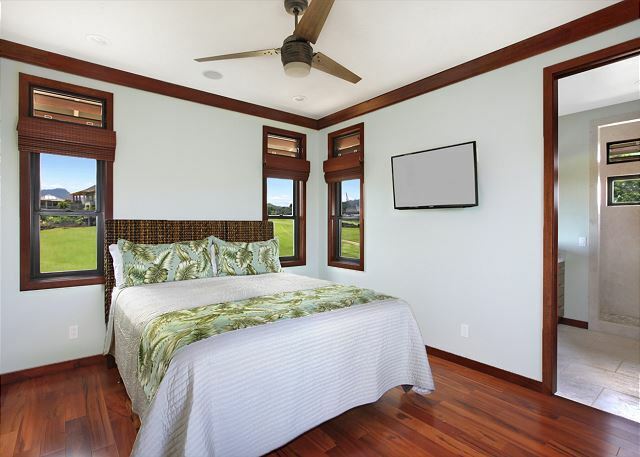 Perfect for a family or multiple couples to enjoy Kauai in pure comfort, everything in this tropical hale is sure to impress. 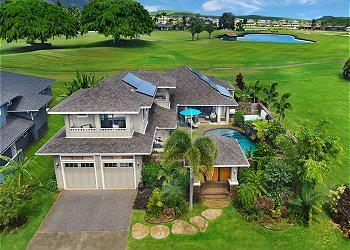 Located on the 18th fairway of Kiahuna Golf Course in Poipu Beach Estates, you are less than half a mile from the ocean and minutes from boutique shops and over 30 restaurants. This house was amazing and exceeded our expectations. We were a family of 6 adults, 2 teens, a 5 and 3 year old. This house was so clean, beautiful and fit us all perfectly for a week (we could have easily stayed forever). The house is close to two little shopping centers with boutiques and good eats. Great beaches are near by but honestly just hanging out at the pool with waterfalls and a hot tub made the vacation extra relaxing. ATVing, zip lining, surf lessons and other activities are close by. Also a Costco for family home dinners. I would definitely recommend this place to everyone. We had an extended stay at the Makalea. Absolutely gorgeous home, well equipped with the best amenities from the linens to the dishes, to the appliances, to lots of beach toys for kids and beach boards for teenagers, beach chairs. You name it this house had it. Beautiful location. Always sunny. Spotlessly clean, roomy and very new. The manager was awesome with any question we had. This is my new favorite place to stay. Will be back for sure. My wife and I celebrated our 50th Wedding Anniversary in the House. We had family and friends join us throughout our stay and the house was a tremendous success. 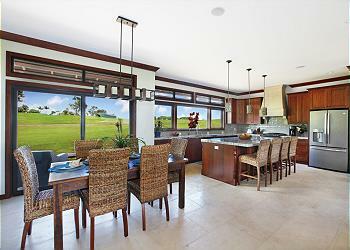 The layout with the kitchen, family room, and lanai area flowing into one big open space was perfect for our needs. There was always a breeze blowing through the house that made for comfortable living. The pool and jacuzzi were big hits with kids and adults alike. The management company was very responsive to all of our needs during our stay. The location was ideal for beach, shopping and dining. Great home! I highly recommend this option for a memorable vacation experience. We had a perfect celebration for Papa’s 70th Birthday. 3 families and 4 grandchildren. Loved the pool. The linens felt wonderful. The beds super comfortable. 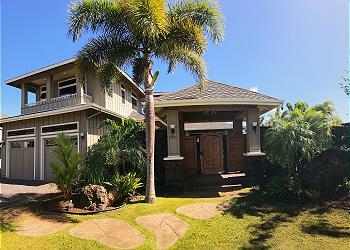 This house was by far the best I’ve rented in Kauiai. 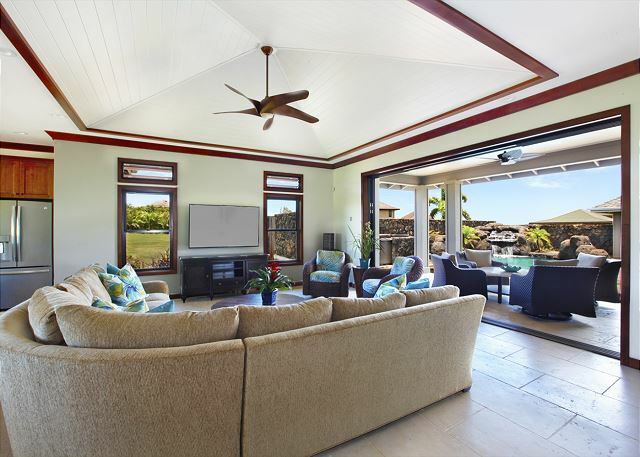 We are frequent travelers to Kauai and this house was perfect for our family of 9. 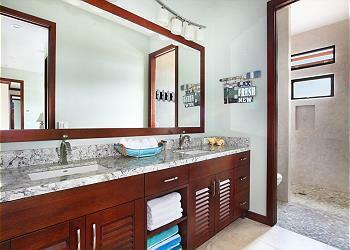 Every room was well appointed, from the kitchen to the bathrooms to the bedrooms. My favorite part of the house was the lanai and pool. We spent lots of time just hanging out by the pool, sunning in the plush chaise lounges or reading under the outdoor fans. 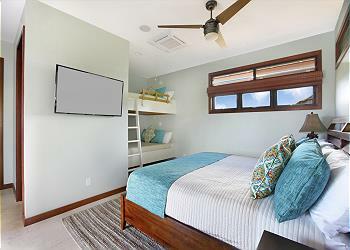 There is A/C in every bedroom. One thing to note: there are two separate master suites upstairs each with their own keyless entry. Great for couples who want privacy but perhaps not suitable for very elderly (there is one set of stairs) or very young kids. There is a set of full bunk beds and a king bed in the main house along with a master suite. Kitchen is very well stocked. Double washers/dryers in laundry room. More than enough pool towels. TVs in all rooms. It’s a smart home with an excellent sound system. We could choose which rooms to stream music into. 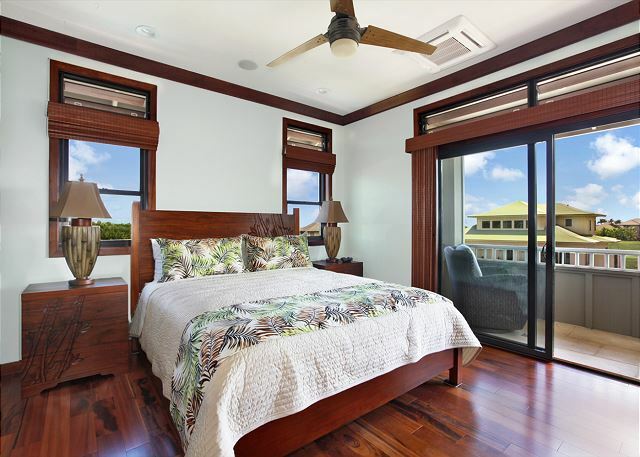 Excellent location, walking distance to Poipu beaches and shopping. Stay here! You wont want to leave! Very positive experience from all participants, aged 18 to 79. We all enjoyed the pool. The lanai area was used and enjoyed by everyone. I don’t think we used the sofa and living room facilities at all. Master bedroom was amazing. Kitchen was clean and efficient. We all agreed we would like to return to this property. We loved the location of this home. Close to shopping and beaches. It was so great for our kids to be able to swim whenever they wanted to instead of living by hotel pool hours. The two washers and dryers were very convenient. The lanai was a fantastic place to have dinner by the pool. We all thoroughly enjoyed our stay in this beautiful home. Also, the beds are super comfy! The property manager quickly responded to all of our inquiries and was exceptional in accommodating our every need. 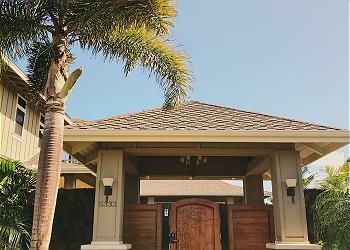 Our family had an incredible time in Kauai and top of the list was the most impressive home that we rented for our stay. All we could have asked for in comfort! We enjoyed the living area that accommodated our large family in the evenings after a great BBQ from the front deck. The bedrooms were extremely comfortable and kitchen well stocked with all the needed cooking utensils that we could ever imagine. Greatly appreciated the management company who everyone we talked to were extremely professional and accommodating ensuring that we had arrived safely and determined if all our needs were met. We will be back again next year and hope that this beautiful home inside and out is available for another great week of adventures. 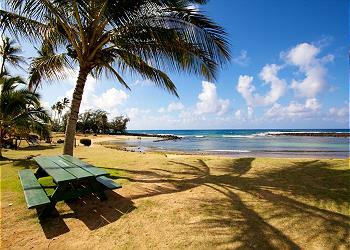 Best Possible Hawaii Vacation Setup I Can Imagine!!! Having experienced a variety of venues; all-inclusive resorts to typical rental properties, this is BY FAR THE BEST setup I have seen! Pictures are amazing but don't do it justice. Beautiful stonework and woodwork/cabinetry and appliances. No noisy neighbors, complete seclusion for privacy and a great pool for kids/guests. Kids were content to never leave (I had to drag them from the pool so they could actually get some sleep at night ;)). Fully automated/wired lights, TV, entertainment system throughout. 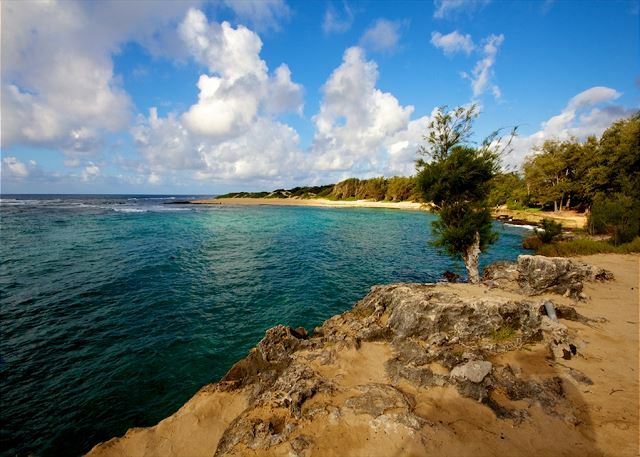 Minutes from best beach in south shore. Golf course behind home plays great! The management company (and Kalo) is bar far the best and most responsive I have experienced. If there was a way to rate 10 stars, I would do it! I can go on and on! I will definitely do this again on next Hawaiian vacation! Everything was perfect. The house, location, and management company were great. The house had everything we needed for a ten day stay. The House was close to shopping and restaurants. We all had a great time. Incredible the most beautiful home i have ever stayed in! Way better than staying in a hotel with your own private pool and five minutes away from the best restaurants and beach. This house is unbelievable. From the incredible pool with waterfalls to the bedroom suites. We rented 3 houses for our wedding party and was glad I got to stay in this one. 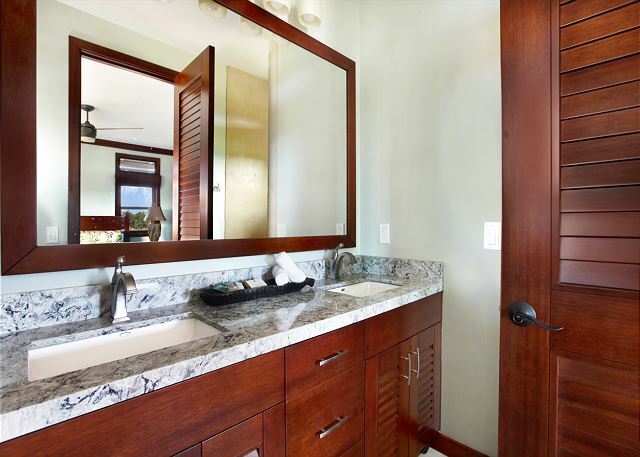 Kauai is an incredible destination and this house made it even better. The house is better than described. It's hard to put into words when it's perfection. 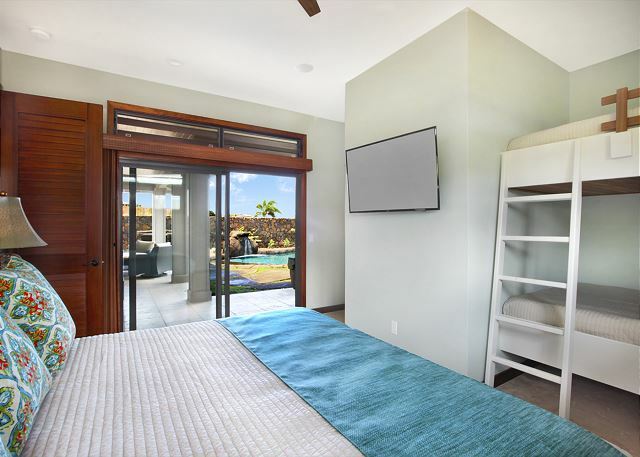 Great for multiple couples to have their own quarters and space and have a central location in the kitchen and family room that opens right up to the pool and hot tub. 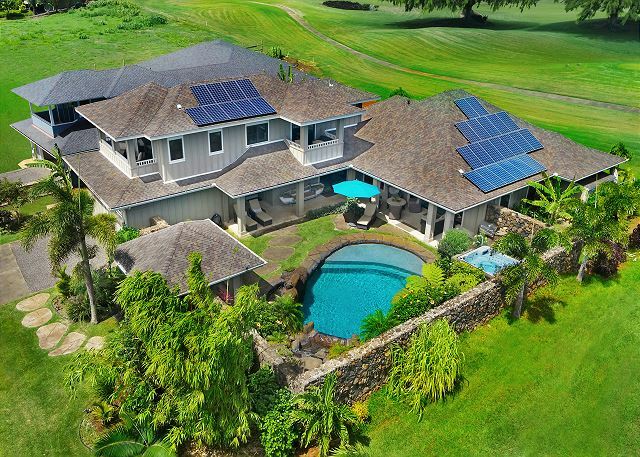 If you are going to Kauai, this is hands down the house to have. Overall excellent vacation home. Took a little while to figure out all the technology, but once that hiccup was taken care we had a blast. We had few other issues but they were taken care of promptly and without hassle. Our kids especially loved the pool which had a pretty large shelf for our non swimmers to splash on. From the start our vacation experience with Kauai Exclusive was great. Easy booking, attentive help, but not invasive.. And the property we rented was beyond our expectations....beautiful, clean, fitted our needs perfectly! We would definitely book with them again and book the property again. Loved the location, and the house! We were able to check in early, as we were coming from Princeville with perishables, so that was a plus. Upon arrival the house wasn't a clean as it could have been (needed vacuuming and mopping and change of beading).. but a minor inconvenience. The house is awesome, and has tons of tech and a sweet pool! The subdivision isn't completely built out yet, so complete privacy on three sides was a bonus! The management staff was perfect, the concierge service perfect, the experience was awesome. Would be nice to have a schedule posted in house when gardners/pool service is scheduled so there would be no surprises... but no big deal. We will be back! The Poipu House at Makalea is absolutely gorgeous with so many fine details! We were a party of eight and this spacious home was perfect for us. Whether we were sharing a family meal in the beautiful eat in kitchen or lounging poolside, this home offered the perfect setting for a relaxing vacation. We could not have asked for a more perfect house for our family vacation in Kauai! We travelled with 8 adults and 3 young kids and this home was everything we hoped for and more! The house is brand new and in immaculate condition. 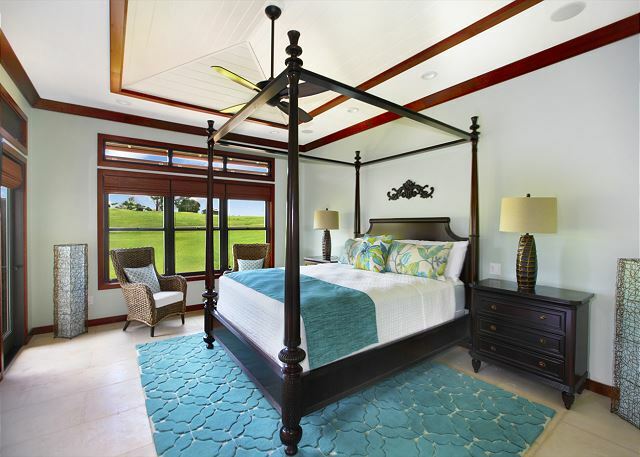 There is plenty of room for each family to have their own space in their respective master suite. There are high end appliances and TV/electronics. The pool is perfect for a family with young kids as there is a very shallow \"swim off\" area where toddlers can play and splash without having to swim. We initially had some difficulty working the wifi and TVs, but we received excellent customer assistance from the IT person and had things resolved on our first day. We were able to have music playing throughout the house and on the lanai, which was great. The only additional thing we could have asked for was some sort of \"instruction manual\" on how to use the electronics, trash procedures, etc. Overall this house was perfect for our family and an absolutely beautiful homebase to our dream vacation! 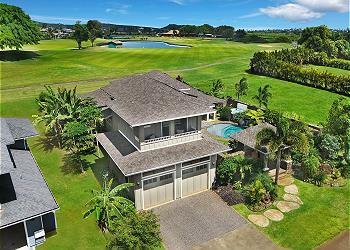 Highly recommend this home and Kauai Exclusive!